The world of watchmakers taking inspiration from the Fifty Fathoms and, or, the Tornek-Rayville has been very active these past weeks, as demonstrated by the different threats on the subject. Giving into the buzz, I eventually chose this bird. 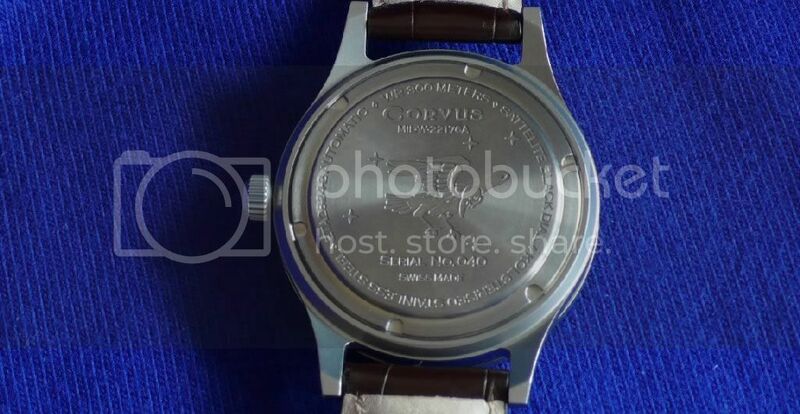 Corvus is a US brand, founded by two watch enthusiast brothers, Cam and Tom, particularly keen of the watches supplied to the US army. Incidentally, Cam has written several long threads on the subject on English-speaking forums. The Bradley is the brother’s first watch, and they “wanted to stick to the military MIL-SHIPS-W22176A specifications”, as the original Tornek-Rayville did, with the “performances and ruggedness allowed by the latest innovations”. That’s for the story. Copy, homage, not even homage? This is not the purpose of this review, and I will let the reader be the judge of that! Package delivered on Wednesday morning… this is what one can call fast shipping! 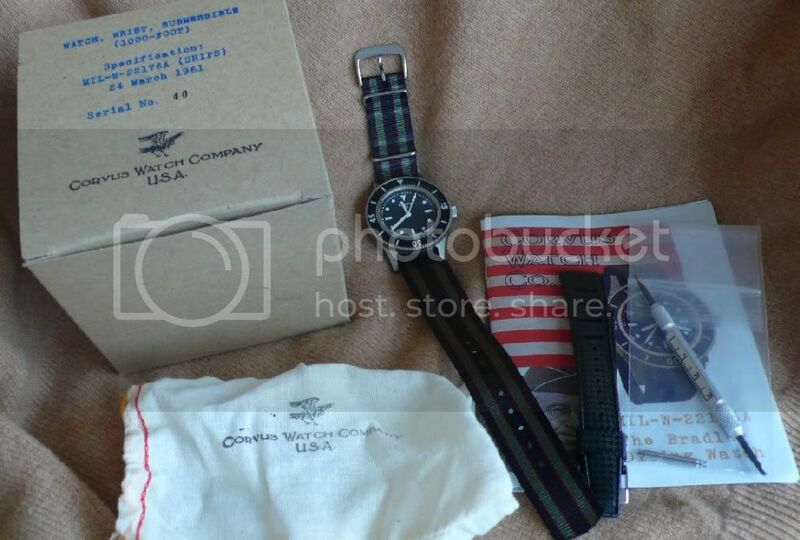 The bird comes in a small fabric bag, with the real Bond strap. The bag is surrounded by recycled paper in a small military-like box and comes with a Tropic strap, a set of spare spring bars and a convenient strap-changing tool. Everything is carefully packed in a big box filled with styrene foam. It could fall from a plan and not get damaged! The watch features a wide bezel, the dial is extremely legible with a nice “diver” look, a blend of retro and modern style. A bit unusual but it kind of grows on you. The case has reasonable dimensions: less than 42 mm of diameter (crown excluded) for 13.3 mm of thickness. It is rather thin, but since it is very cylindrical it looks thicker than, say, a Speedmaster. It features a small screw-down crown and the lung space is 20 mm. The case received a “Kolsterizing™” treatment, similar to Sinn’s “tegiment” treatment, of a very nice aspect and extremely resistant. While changing straps, I haven’t managed to scratch the surface, even though I am a champion at leaving marks. The dial and hands are extremely legible. The dial, with its “satellite black” paint shows an extremely deep black, creating a sharp contrast which sometimes seems surreal. It sometimes looks like the figures are floating… which gives a very modern look to this watch. The indexes are painted. I find that they lack volume, but it might have been intentional. The uni-directional bezel rotates counter-clockwise and with 60 increments it is spot-on. Not a degree off-angle, nada, zip. It is fairly hard to turn so there’s no risk of that happening by mistake. 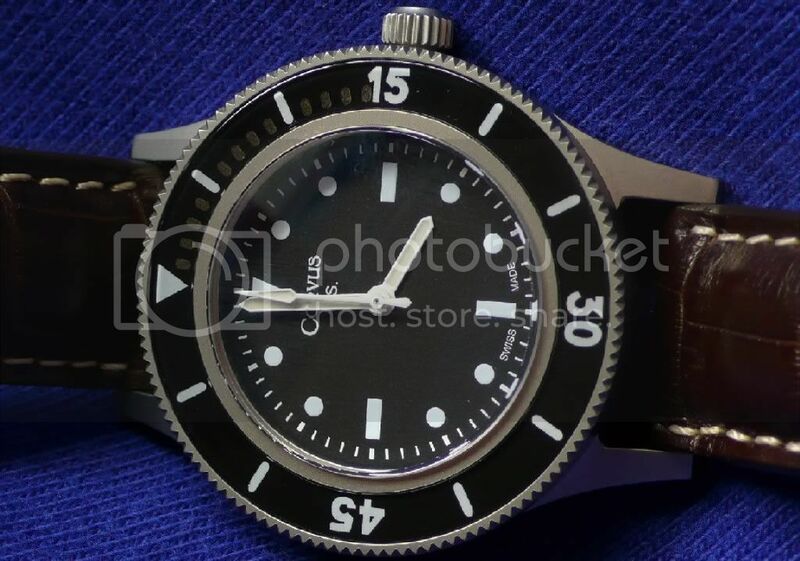 The bezel markings are extremely readable, but in my opinion they lack some finesse. 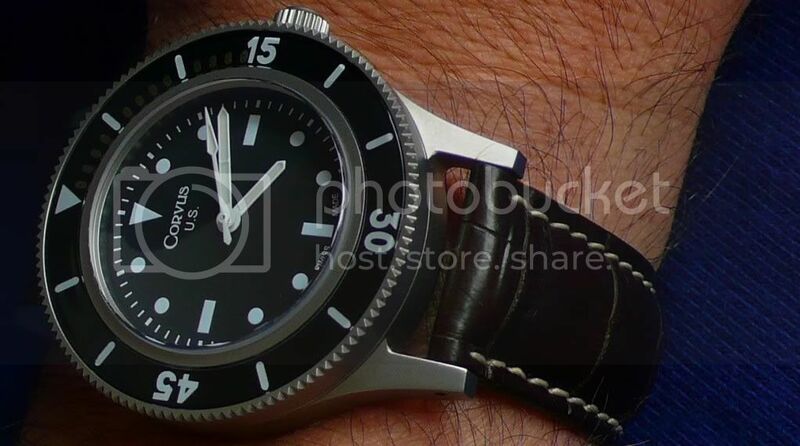 The first 15 minutes are marked with “stealth black Luminova“, which is akward because I wonder how useful it is. The Luminova is great, it doesn’t shine like a bedside lamp, but it glows when you go from light to darkness. It is extremely readable and hold all night long and the hands have a nice blue haze, while the indexes are green and the stealth Luminova is yellow. I find it nice and practical. The sapphire glass has anti-reflection coating on both sides and protrudes by 2 mm from the case, giving a very nice vintage look. One word about the case back: it isn’t thrilling, And by the way I believe the offer to change it for free. But it’s the case back we’re talking about and to me it doesn’t really matter. Let’s just say the bird engraved is rather odd and the spelling approximate (let he who is without sin cast the first stone). The movement is an ETA 2824-2, well that is so common, but it runs well, it is worry-free, and I believe it is pretty accurate. I haven’t really measured, but I couldn’t care less. 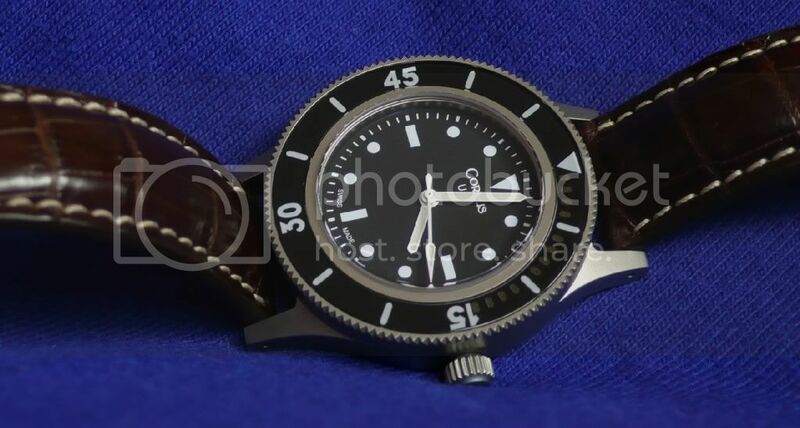 As I wrote earlier, the watch comes with two straps, a NATO and a Tropic, both comfortable, but I can’t help thinking that the watch looks great on a leather strap. Overall I am very pleased with my choice, even if amongst the competitors, this is not the cheapest choice. But I think you develop a bond for this watch and despite its smooth and clean aspect something stands out. The style split between vintage (the case and hands) and modern (the surface finish and the dial) makes it unusual. 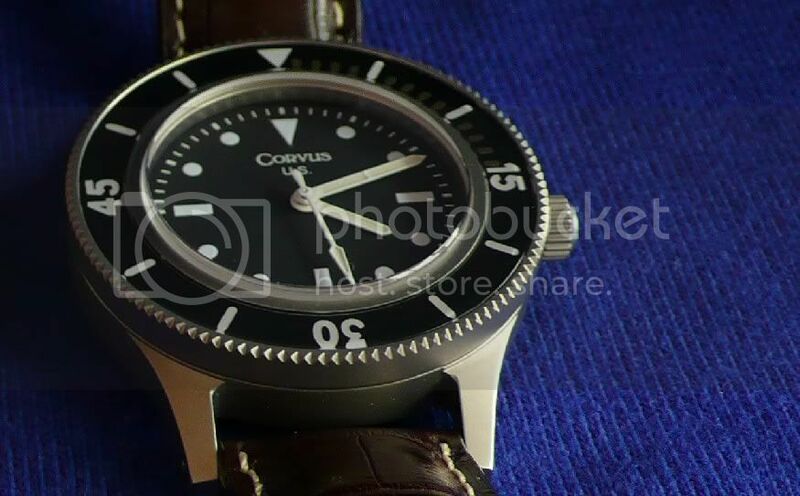 For their first watch, the lads at Corvus have done a good job, and I hope they will carry on in this direction: quality, readability and “subtle inspiration“. Original article written by Axel Frans Lemarchand, AKA Wallace, and translated by Francis J.